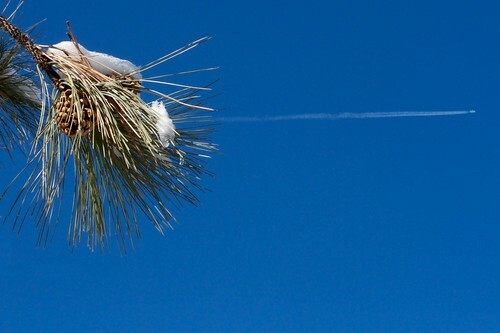 The other morning I was out aiming for some photos of the fresh snow on the pines in my back yard- my timing was good as a passing jet was scratching the sky with contrails, and in a flash I aimed to angle a photo with it in the background of a branch. Boom when I saw that in my stream, I said, this has to be GIFfed, making an animation from a single photo. It looked like something was shooting right out of that pine tree. Woah, see even in Arizona, the pine trees are armed with pistols! I don’t know whether to put this GIF in for Gun Crazy GIFs or GIFFing Impossible! so I am tossing it in both. This is where it helps to think in stacked layers. I knew I wanted to make the contrail emerge from behind the pine branch. So I copied the left upper corner (the pine branch) to the top layer. I then lasso selected around the contrail, and cut that from the background layer to its own middle layer. I used the magic wand (reduced tolerance to 4) to select and subtract the blue around it. Back on the bottom layer, I clone brushed the blue background to cover where the contrail existed, so I had a solid blue background. From the top layer, I used a small eraser brush, and just brushed out some of the blue around the leading edge of the branches where I wanted the contrail to emerge. In the animation palette, I used convert Layers to Frames, to get a three framed animation. 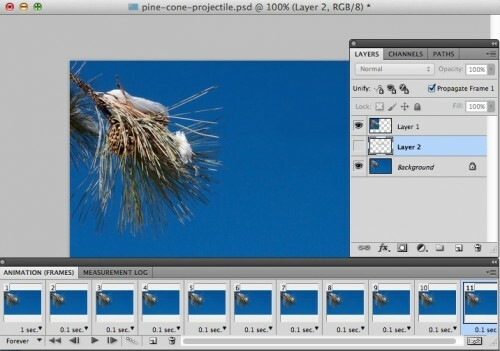 I turned on all layers in all frames, and slid the contrail layer to the left, so it as tucked in behind the top layer pine branch. I used copy frames, then paste frames (after) to extend the animation to 11 frames. I then went frame by frame, and moved the contrail a bit tot he right in each frame, so it moved along the horizontal, and then passed off the right side of the screen. I set each frame to 0.1 seconds, except the first one I set to a full second. This one came in at only 73 Kb! That’s because of using layers with small bits per layer, but also the large areas of solid blue compress well in GIF. So when you are in Arizona, keep in mind that even the trees are packing heat! And not the “dry kind of heat”!